I may call the Washington, D.C. region home these days, but I spent the first 93 percent of my existence in northern New Jersey, and will always identify as a proud son of the Garden State. That’s why I retroactively berate my younger self for voluntarily abstaining from what is indisputably North Jersey’s greatest culinary contribution (fight me) for most of my adult life. You see, I chose not to eat meat for 20 years—the first 14 as a pure vegetarian and the remaining six as a pescatarian—and that meant two whole decades without my home state’s signature hot dog: the confusingly named but completely delicious Hot Texas Weiner. Let’s get this out of the way: The Texas Weiner (deliberately spelled “ei,” rather than “ie” for some reason) has no actual connection to the Lone Star State. The origin of the term is a source of ongoing debate, but the prevailing theory seems to be that the presence of chili is what, in Mid-Atlantic minds, makes it Texan. Even that assertion is questionable, as the chili barely resembles anything you might find in its namesake state. In fact, the more-sweet-than-fiery combination of ground beef (sometimes mixed with veal), chili powder, and various baking spices (no beans!) has more in common with Greek-style spaghetti sauce than it does with anything cowgirls and boys might devour next to a campfire. And that’s no accident, as the Texas Weiner’s earliest purveyors—roughly a century ago—were Greek-American hot dog vendors in Paterson, N.J., a city about 20 miles northwest of Manhattan. The great Hot Texas Weiner dynasties throughout Paterson and in neighboring municipalities like Clifton, Hawthorne, and Haledon (my hometown) lived and died by their sauces, guarding their recipes like state secrets. 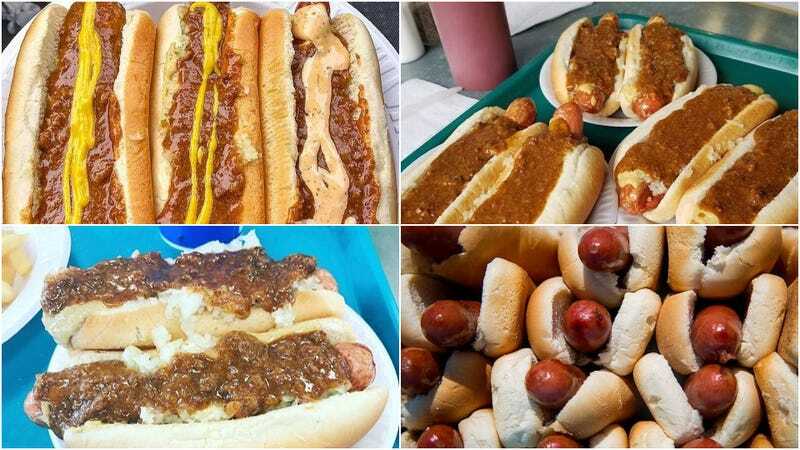 But it would do the quintessential North Jersey dog a disservice to say that it’s all about the sauce. It’s really a greater-than-the-sum-of-its-parts-type scenario. And, perhaps, the greatest of those parts is the frank itself, one that’s neither steamed nor grilled, but fried. And by fried, I mean deep fried (though a few get away with griddle frying it). Not the healthiest thing in the world, I know, but if you’re worried about nutrition, why are you eating a hot dog in the first place? Besides, the moderately crunchy texture and residual oiliness elevate the dog to such gustatory heights that’s it’s worth the extra saturated fat. That’s especially true when you order it “all the way”—topped with yellow mustard, chopped raw onions, and the aforementioned sauce. The memory of those four elements combined (five, if you count the bun) never left me throughout the 20 years that I deprived myself of their wonderfulness. I always joked in those days that if anything ever brought me back to the Dark Side (the carnivorous side of the Force), it would be a dog from one of my childhood haunts. My return to carnivorism didn’t happen exactly that way. But within a week of my return to meat-eating, I made the 25-mile northwesterly pilgrimage from Jersey City, where I lived at the time, to Hawthorne, home of The Goffle Grill (est. 1979)—one of the handful of Texas Weiner joints that outlasted my meatless phase. It was everything I remembered and more, so I was determined to see how the rest of the old-standbys held up. The hands-down winner among those is The Hot Grill in Clifton, a place my maternal grandmother introduced me to when I was about 4, but I never fully appreciated until I had tried all of the competitors. The place has been open for nearly 60 years, so it must be doing something right. Runner-up: Johnny And Hanges, which opened in Paterson in 1939 but moved 60 years later to the borough of Fair Lawn, about a mile from its original location. Interestingly, one of the most famous North Jersey hot dog joints—known inside and outside the Garden State—doesn’t even serve a proper Texas Weiner. Rutt’s Hut, a Clifton institution since 1928, made the deep-fried dog, a.k.a. the “Ripper,” famous without the chili sauce and other requisite accoutrements. Instead, it prefers to showcase its revered homemade sweet yellow relish, which really should be a condiment category unto itself (John Holl’s cookbook Dishing Up New Jersey features a recipe for the stuff). You can order chili, but the servers won’t put it on the dog. You’ve got to settle for it on the side and slather it on yourself, if you’re so inclined. I usually just treat the two dog styles as completely separate entities: Sometimes I want a Rutt’s Ripper with relish and sometimes—well, most of the time—I want a Texas Weiner, “all the way,” and never the twain shall meet. The Texas Weiner became my own personal white whale. The closest in-the-wild encounter I had was at Haute Doggery in Las Vegas, which has a “Jersey Ripper” on the menu, but it’s just a vague approximation of the Rutt’s Hut version, though it does come with yellow relish. I had to be that guy and asked them to synthesize a Franken-frank, marrying the best parts of that one with the chili and onions from the menu’s Detroit Coney Classic. It still wasn’t the same. But I finally realized that I shouldn’t be lamenting that fact, I should be celebrating it. It made me, for the first time in my life, fully embrace my roots. If I want a po’boy, I’ll go to New Orleans. If I want a lobster roll, I’ll go to Maine. If I want a Chicago-style dog, I’ll go to the Windy City. But if I want a Texas Weiner, I’m going to New Jersey. All the way. Why confine pepper-and-egg sandwich season to just 40 days?